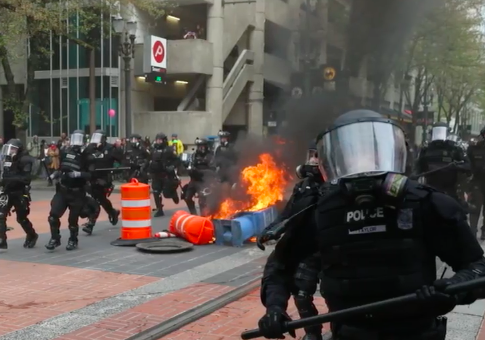 May Day protests in the Pacific Northwest turned violent Monday as anarchists descended on Portland, Oregon; Seattle; and Olympia, Washington. Portland police designated the protests as a riot, discouraging people from coming downtown unless completely necessary, according to NBC News. Lili Elbe, spokesperson for the Portland May Day Coalition, told local NBC affiliate KGW that she believed the anarchists did not mean to create a violent situation, adding, "They are doing their own thing." Police canceled the protest permits for all groups about an hour and a half after the event began as anarchists started throwing rocks, bottles, and incendiary devices. Portland fire fighters reportedly rushed through crowds to put out numerous fires. KGW reported that 25 people were arrested during the protest on charges ranging from arson to criminal mischief. In Seattle, police prepared for many non-permitted protests and fought to separate supporters and protesters of President Donald Trump. In Olympia, Washington's capital city, protesters were throwing bottles, rocks, and pepper spray at police officers and journalists. Eight people were reportedly arrested during the incident. Elsewhere, more peaceful protests resulted in a handful of arrests in New York City; Oakland, California; and Montreal. This entry was posted in Politics and tagged NBC News, President Trump, Protests. Bookmark the permalink.